Cash jackpots are won every day, by gamers all over the world. Knowing this, you’d think all of us would be more likely to win something. Unfortunately, the odds are never in our favor. But the fact is, someone has to win all these jackpots—slot machine jackpot, lottery jackpots, bingo jackpots, small, large and gargantuan jackpots! I imagine I’d go “ape wild” if I hit a nice, 6-figure jackpot. You probably would too. And I’m fairly certain one Italian player at the online casino, Betpoint.it, did just that last week while playing the Banana King Online Slot by WorldMatch. The player hasn’t been named, but no doubt he’s having an anonymously grand time these days. The lucky Italian scooped the Mega Jackpot on the Banana King Online Slot for a hefty €686,000 payout. The big win came after the player lined up the best combination in the game—five gorillas across an active line. An IGB press release announcing the win supplied this image of the winning combination. According to that report, Banana King has been a top performer for WorldMatch ever since it was installed on their Italian-facing software client in February 2018. Almost a year later, the simian jungle themed slot machine has been the most successful mobile game for the company, and their casino licensees. With this staggering jackpot win, it’s now the most successful paying game for their players, as well. If Donkey Kong took a holiday in the Amazon Rain Forest, this game would be it. The 5×3 reels are teeming with vibrantly festive imagery, with a cartoon jungle as the backdrop and a musical score to match. Players can activate up to 25 paylines with bet sizes of 0.01 to 2.00 per line (0.25 to 50 max bet). Special symbols include a tropical cocktail Wild (that only does the most basic job of any wild symbol), a Free Spins scatter, and a Monkey Bonus. Free Spins are awarded when 3 or more scatters appear anywhere on the screen in a single spin. 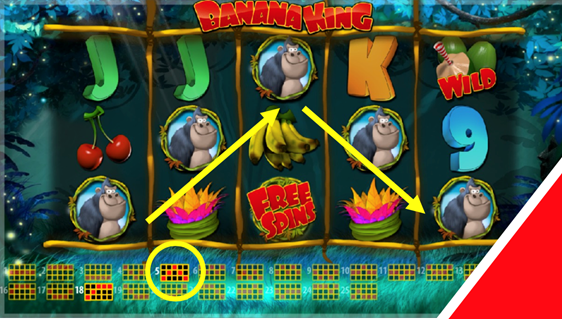 Banana King is generous with this feature, delivering 15, 30 or 60 free spins for 3, 4 or 5 scatters respectively. Much like the game’s wild symbols, free games don’t offer anything special, like multipliers, stacks, or better win frequency, so it’s a good thing they come in such abundance. The Monkey Bonus feature triggers when 3 or more of these bonus symbols appear in any position. The game transitions to a second screen where players will help the indecisive gorilla choose which bunches of bananas he’d like to eat. Players will continue selecting bananas, winning the credits displayed beneath them, until the word ‘Collect‘ appears. That’s all there is to it, really. 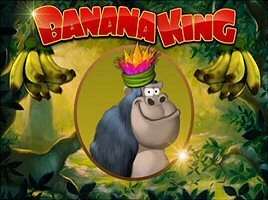 After playing the Banana King Slot demo for a bit, I’d say it’s an interesting game with a cute theme and graphics, but probably not one I’ll ever spend real money on. The mechanics aren’t as feature-rich as I’d like, but the real problem is the RTP, which comes in at just 91.8%. I understand that online casino jackpots have to set lower RTPs than non-jackpot slot machines, but this one does not payout its mega prize nearly often enough to play for such a small return.